Each Volant Exhaust System is made from premium, heavy gauge stainless steel to deliver lasting performance on or off-road. Designed with a full-throttle muffler design, Volant exhaust systems are mandrel bent to eliminate restrictions and straight-through to maximize the airflow and performance capabilities of your vehicle. Using cutting-edge manufacturing techniques and engineering, Volant exhaust systems are acoustically balanced to deliver a head turning aggressive exhaust note with little to no drone. Every Volant exhaust system goes through in-field testing to ensure it can live up to its Limited Lifetime Warranty, regardless of the environment. 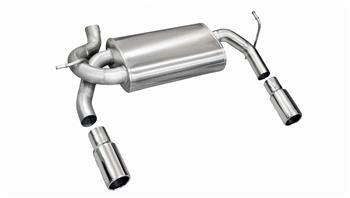 Volant Exhaust systems are proudly made in the USA.